Last spring, I watched a bluejay visit a robin’s nest and steal eggs. Like many other animals, bluejays are adept at larceny. And since animals apparently have no conscience, stealing comes naturally. Burglers and robbers exist in nature so why should humans be any different? Human beings are not above theft. Owning a conscience should distinguish us from animals but sadly, that isn’t always enough. So humans steal. 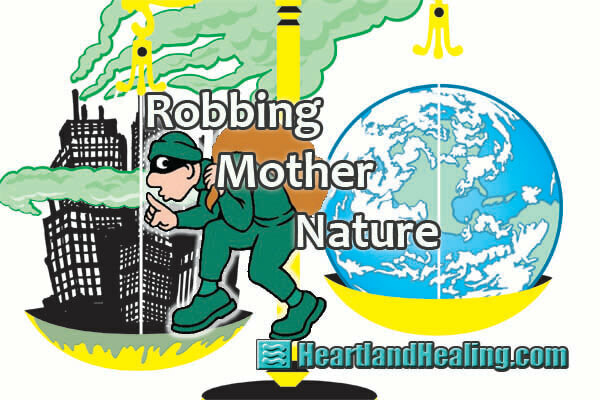 Humans even steal from Mother Nature. About 75 percent of all new pharmaceutical drugs are developed from plants found in nature. The drugs bought from your pharmacy to treat your headache, your cold, your high blood pressure and cholesterol levels all are found in a natural form. More exotic drugs like cancer treatments, blood thinners and pain killers are developed because pharmaceutical companies stole the active ingredient from Mother Nature. By isolating what human hubris determines is the singular “active” ingredient in a whole plant or portion thereof, our reductionist science thinks we’ve made it “better” or more effective. In fact, we often end up increasing dangerous side effects by smelting what we think is a “silver bullet.” And shoot ourselves in the foot in the process. Just look at what common medicines we have stolen from Nature’s pharmacy. Digitalis. This is a powerful medicine that was isolated in the foxglove plant. Herbalists used the plant as a tea to regulate heart problems. Modern doctors figured it out in the 1700s and used it to treat arrhythmias and congestive heart failure. Quinine. Malaria was the scourge of the developing world in the expansion of the 16th and 17th centuries. The plasmodium parasite that killed millions almost stopped Western colonization of the Americas and Africa. The bark of the cinchona tree came to the rescue. The bitter alkaloid in the tree bark killed the parasite in the blood and cures malaria. Jesuits brought the medicine back from the Amazon to Europe, not only providing a cure for malaria but an important ingredient in Boodles and tonic. Penicillin. Another famous life-saving drug purloined from Mother Nature is this prototypical antibiotic penicillin. It’s a famous story. Alexander Fleming was a research scientist who left a window open in his lab one night in 1928. He also forgot to cover a Petri dish containing deadly Staphylococci bacteria. Happy accidents, those, because Nature did the rest. Floating on the breeze, a mold spore landed in the Petri dish and set up shop. The colony expanded and lo and behold, the mold somehow was killing the deadly bacteria. All Fleming had to do was notice it. And notice it, he did. Though it took 14 more years for penicillin to be used successfully on a sick patient, it opened the doorway, for better or for worse, to a class of drugs known as antibiotics. Antibiotics are credited with saving countless lives since then. Sadly, they have been overused, most notably in the livestock sector, and may be now presenting us with the unintended consequence of an apocalyptic face-off with pathogenic super-microbes that have become antibiotic resistant. Penicillin in its various forms grows naturally and is commonly found in the mold that occurs on bread and on fruit, especially citrus. Historic records show that ancient Egyptians actually treated wounds by applying moldy bread as a dressing. Other cultures used the cultures to successfully treat infections. Taxol. This is the number one anti-cancer drug used against breast cancer. And it comes from the yew tree. Its discovery is not a simple tale but one that is common in the pharmaceutical industry in the modern world. Big Pharma is searching high and wide for any foothold nature can supply to further the goals of modern medicine. Often those goals include patent rights and profit motives. Taxol is extremely taxing to extract. It takes three, mature, one-hundred-year old yew trees to produce one gram of Taxol. For a course of treatment, 19 grams are required. Yew trees have become valuable. And more: Medicines like aloe (skin ailments); periwinkle (leukemia, Hodgkin’s); pseudo ephedrine from ephedra (acute asthma); pilocarpine (glaucoma, radiation therapy side effects); colchicine from crocus (cancer, gout); codeine from poppy (pain, cough); ironotecan from xi shu tree (cancer) — all are derivatives of naturally occurring plants. There is no suggestion here to chew on tree bark to heal cancer. And there is nothing wrong with using what nature provides. Getting in our own way and making a mess of what is provided is the problem. That comes from suspect motivation. Ask the bluejay. There is no honor among thieves.